Well, if one kid was going to have a new gym bag for back-to-school, I certainly couldn’t let the other kid feel left out. 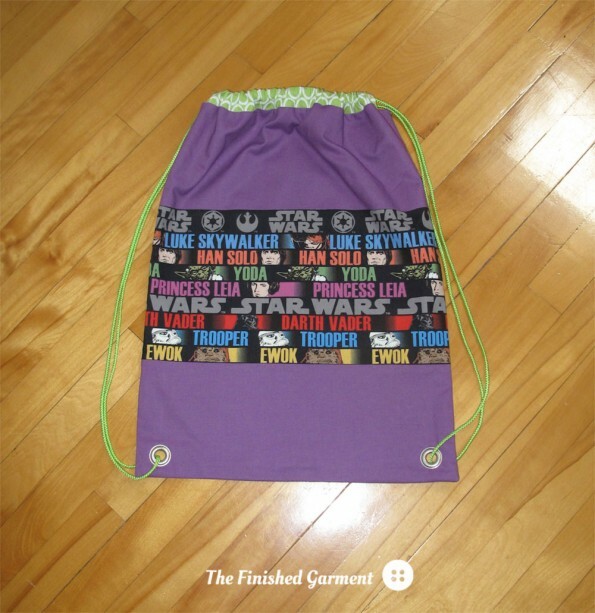 And since there was plenty of fabric left over from her pencil case, I decided that a Star-Wars themed gym bag would be a good plan. 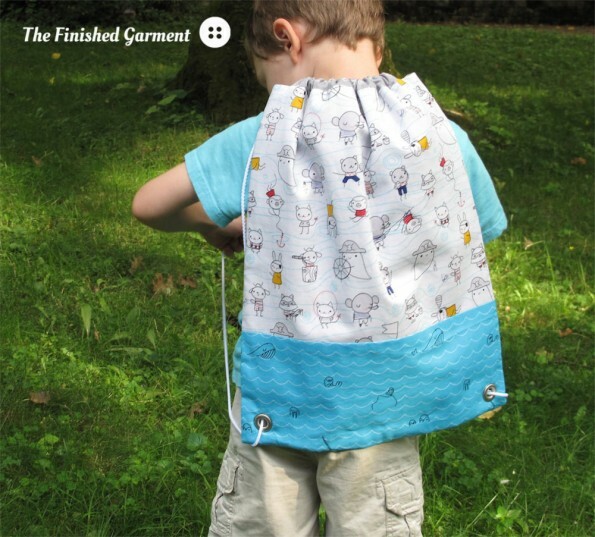 This is a super easy pattern (and free!). It’s also very quick to sew. I used green cording to match the lining. I wanted to use bright colours, but I also wanted it to be practical. I think the purple should wear well. I used Ovals in Lime from the Remix collection by Anne Kelle for the lining. Nice and bright. My daughter helped pick all the fabric. And I think she did a great job. I’m glad the Star Wars fabric doesn’t only coordinate with dark colours. 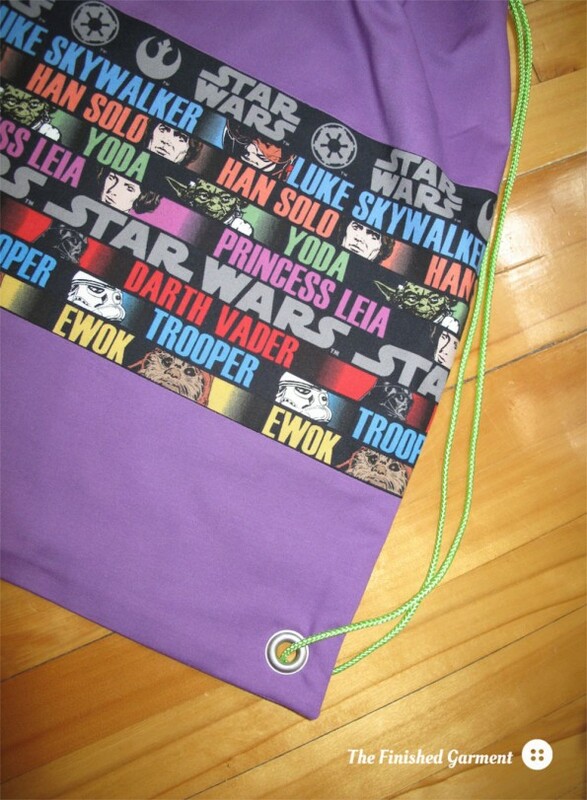 Star Wars and purple don’t always go together, but they do here. Yeah, grommets! Again, the only (barely) hard part was putting in the grommets. I did a practice run first, but these were no problem at all. 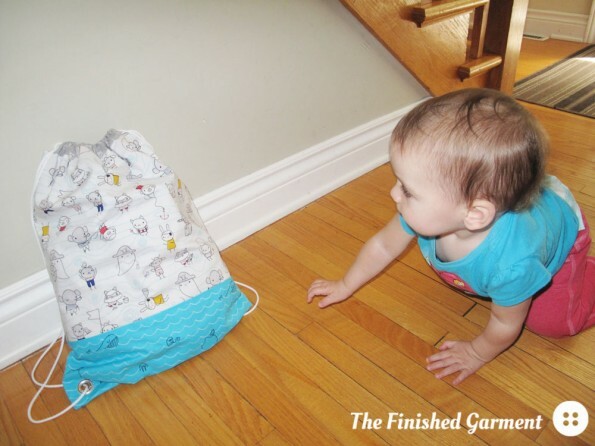 Pattern Review: Jeni Gym Bag tutorial by Katy Jones of I’m A Ginger Monkey. Character Names in Multi from the Star Wars II collection by Lucasfilm Ltd. and TM for Camelot Cottons. Kona solid (could this be Plum?) by Robert Kaufman. Ovals in Lime from the Remix collection by Anne Kelle for Robert Kaufman. Sizes: One size fits most. 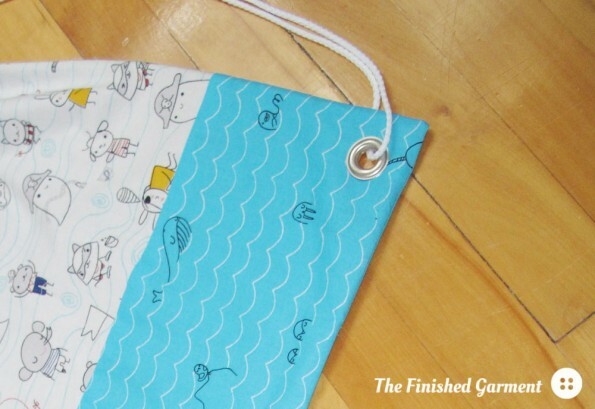 The finished bag is 14″ x 17″. A little big, but room to grow. 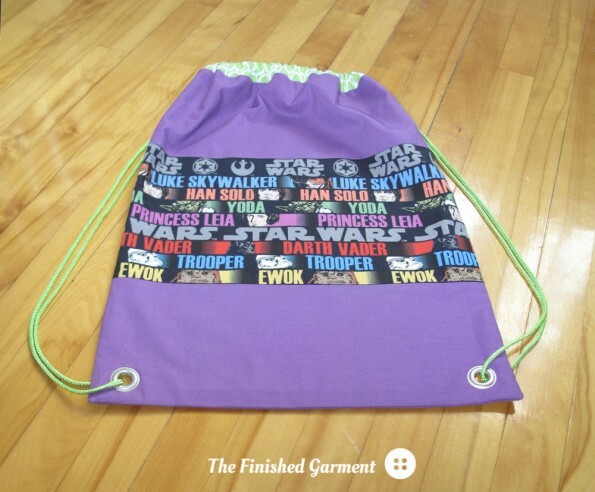 Just to be clear: The Star Wars name is trademarked by Lucasfilm Ltd. and used by the fabric manufacturer under licence. 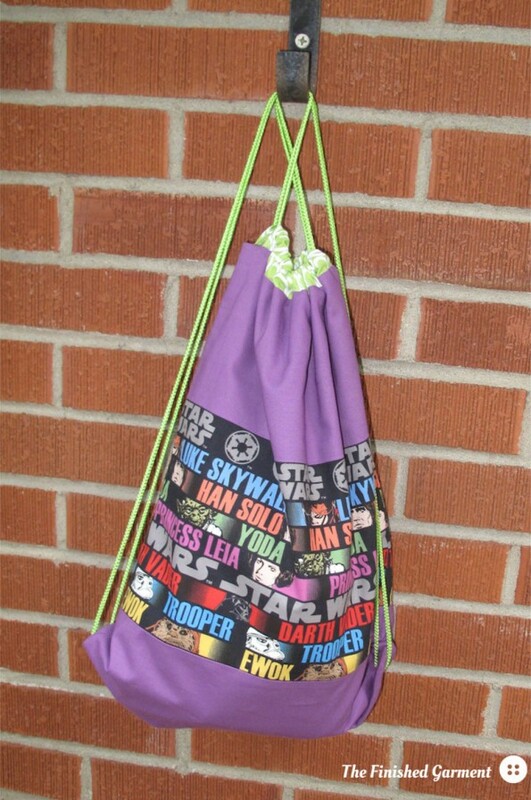 The gym bag shown here is not an official licensed product and is not available for sale. But you can always buy some fabric and make your own! 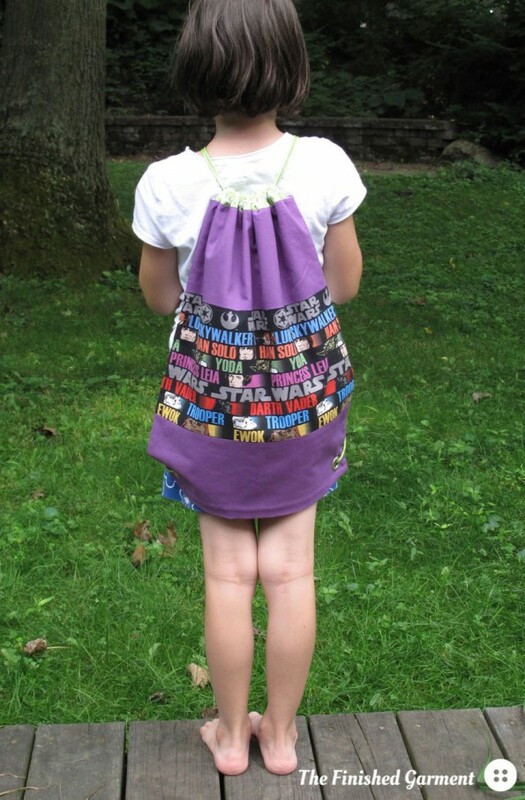 This year I did quite a bit of back-to-school sewing. With two kids in school there is just so much to buy, so it’s nice to be able to make something as well. I started off with six fat quarters from the Seven Seas collection by Michéle Brummer Everett for Cloud9 Fabrics, courtesy Warp & Weft Exquisite Textiles. 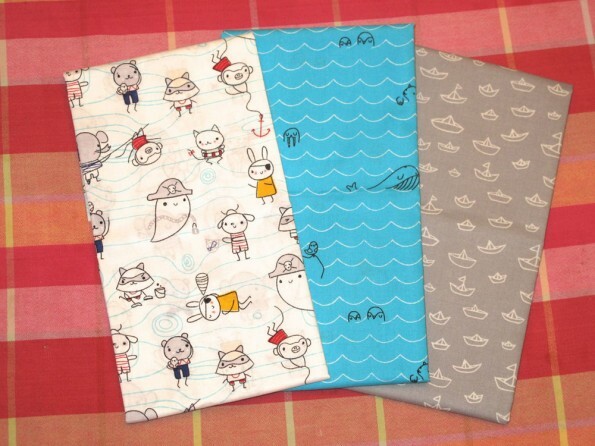 The prints I chose are Laddies Poppets, Sea Critters, and The Fleet in Grey. These are just so darn cute! When my little boy saw them he was over the moon. 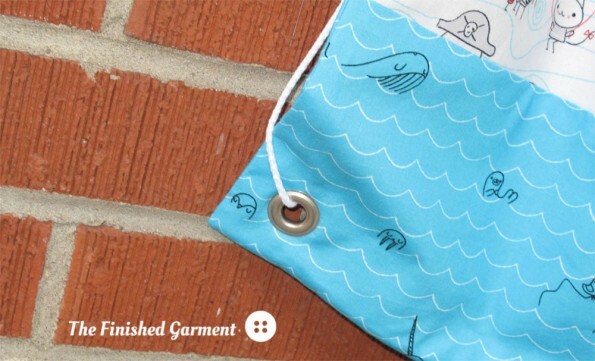 These are really fun prints and the fabric is organic, which is always nice. The Before shot: Laddies Poppets, Sea Critters, and The Fleet in Grey from the Seven Seas collection by Michéle Brummer Everett for Cloud9 Fabrics, courtesy Warp & Weft Exquisite Textiles. 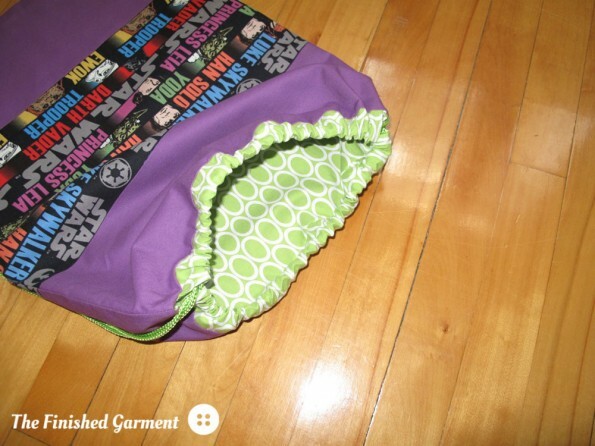 I used the Jeni Gym Bag tutorial by Katy Jones of I’m A GingerMonkey. This is a free online tutorial (with a super convenient PDF download). The directions are very clear and easy to follow. Looks a bit like a superhero cape when it’s empty. 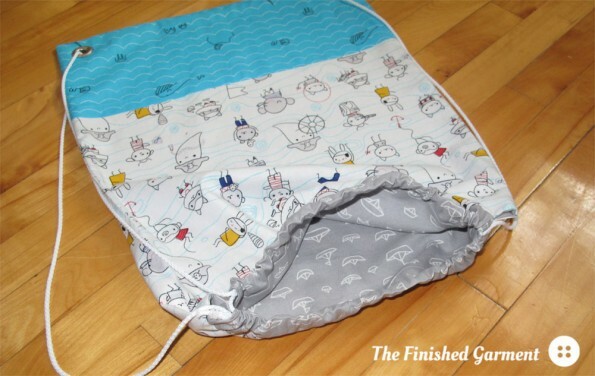 The tutorial makes a lined drawstring bag that is kid-sized. It’s a little big on my 5-year-old but not so big it looks silly. Just big enough that it will last a while though. I used The Fleet in Grey to line the bag. 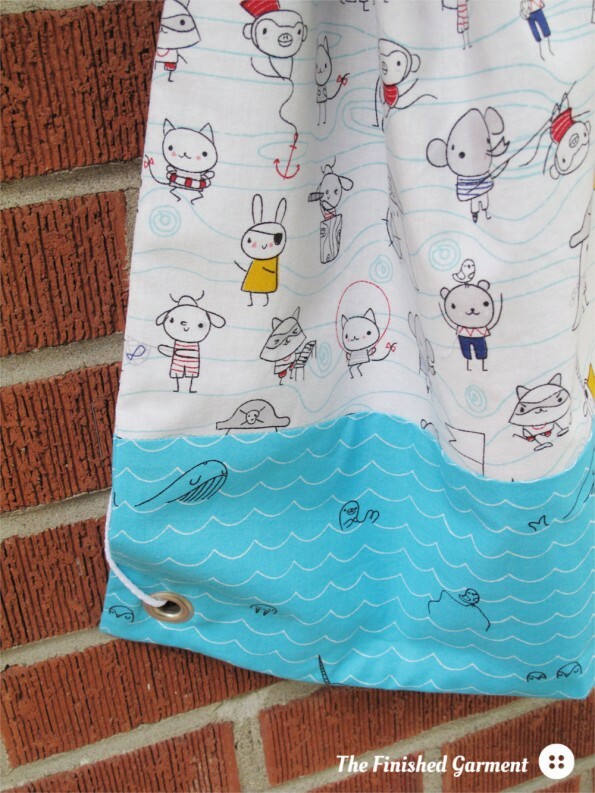 I used white cording for the drawstring, but you could also use ribbon, homemade bias binding stitched closed, etc. Easy for little hands to open. There is plenty of room inside for sneakers and a change of clothes. Love how one of the little poppets appears to have already walked the plank! The toughest part of the pattern was installing grommets (which really were not that hard to install). Much easier than eyelets, if you’ve ever had to use those, because the grommets are so much larger and more stable when you whack them with a hammer. You do need a special grommet tool though. Another shot of my awesome grommet. My son really likes the sea creatures and the colours. 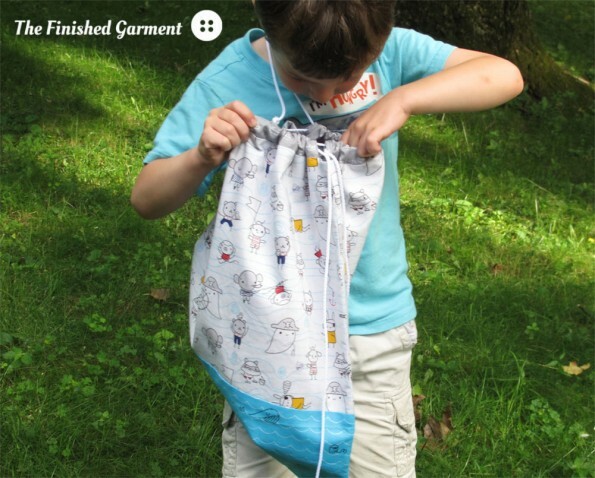 It’s really hard to find fabric for boys that isn’t too babyish, or too serious, or too dark. These prints are bright and fun and and the bag was a big hit. Just one more grommet pic. Really though, check out that great grommet! I’m really happy with this bag. It’s just so much cuter than anything I could buy in the store. And it was super quick to make. In case, ahem, you have to make one the day before school starts because your summer was just too crazy (just saying). 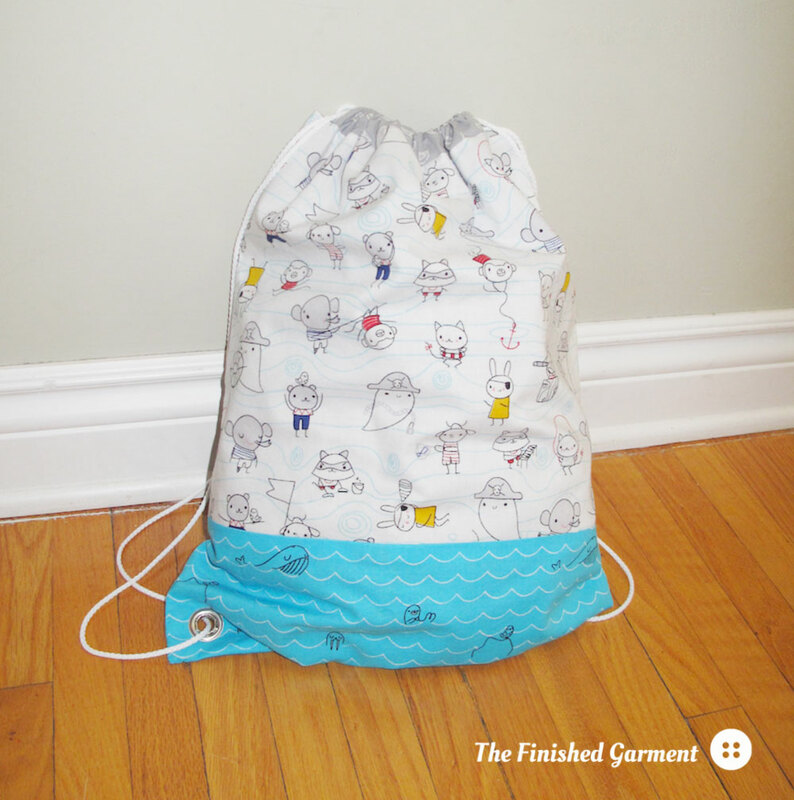 Pattern Review: Jeni Gym Bag tutorial by Katy Jones of I’m A GingerMonkey. 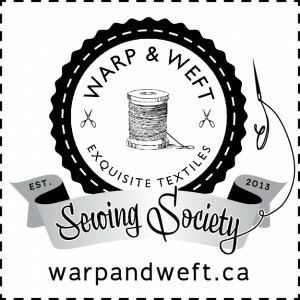 Fabric: Laddies Poppets, Sea Critters, and The Fleet in Grey from the Seven Seas collection by Michéle Brummer Everett for Cloud9 Fabrics, courtesy Warp & Weft Exquisite Textiles. Well now, what could this be? Once the rightful owner was conveniently out of the way, there was some unauthorized testing. 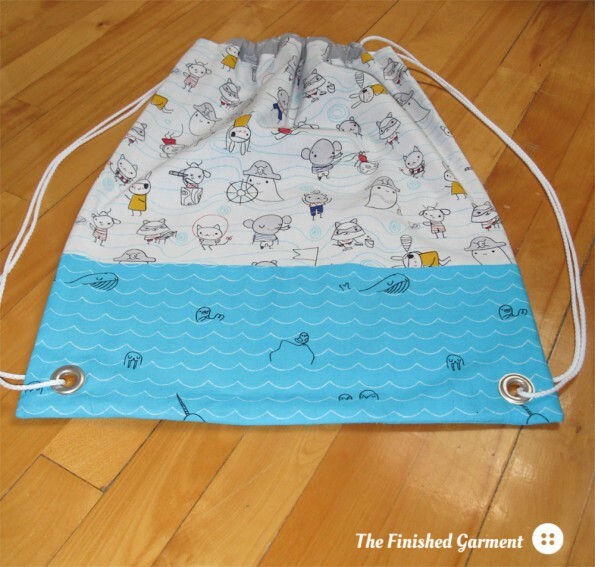 (And no, I do not normally allow my infant children to play with drawstring bags for obvious reasons).